Let's See, Touch and Feel the Mysterious Natural World!! School of anchovy swimming in a circular aquarium... It's like shining illumination. A variety of events are held here such like the Special Exhibition three times a year. The sea in Nagasaki is very rich in diversity. You can look into it here closely! You can see beautiful actiniae, anemonefish etc in these aquariums like store windows. Let's look into the lucent body! You can operate a camera with a magnifying lens to watch small species living around surf zone. Do you know a goggle-eyed goby and limulus? Fish living around coral reef are here too. You can see four types of penguins living in the subantarctic islands. Their behavior is very humorous! You can see Mekong Giant Catfish, one of the world-biggest freshwater fish living in the Mekong River. There is calm Tachibana Bay before our eyes. You can find Shimabara Peninsula and Amakusa too. Once you go out to the outside terrace, it's the inside of the house of temperate penguins. If you wish to be a master of penguin, you should come here where marvelous data is stored. One of the nation's largest screen will enable you to feel the reality, and to have your-drawn-fish swim. You can see the world smallest penguins from Australia. The first gallery in Japan with penguin goods having a variety of looks. At present, you can enjoy "Nagai Collection" of penguins collected for years at many countries by Mr. Kenzo Nagai living in Hyogo Pref. Let's look on three types of penguins living in warm area. You can touch surf-zone species like starfish, hermit crab and sea urchin. Many many penguin items here! Please have a bite of delicious Penguin Pancake! 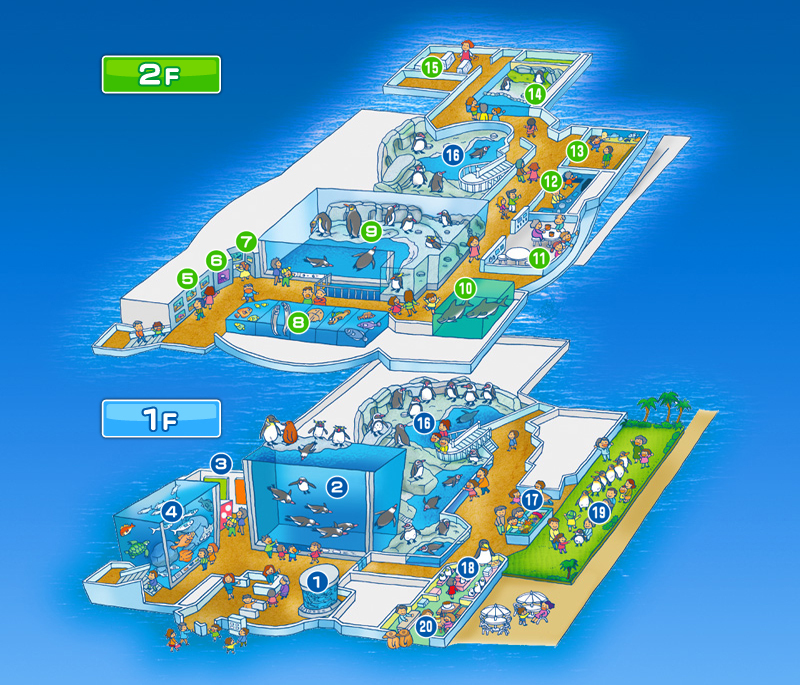 You can enjoy the very popular Penguin Parade, Touch-Penguin etc. There you'll hear and say "Cute!!". Noodle, curry and set-menu are also prepared for you.